Hello! How was your weekend? Mine was pretty much all work, work, work! I expect my family to visit next weekend so I had to prepare myself (I usually don't get much done when they're here, we spend the time talking and cooking). I also went shopping for some maternity clothes... it's incredible how big your belly can grow with a baby inside! First, my PFATT offering for this month. 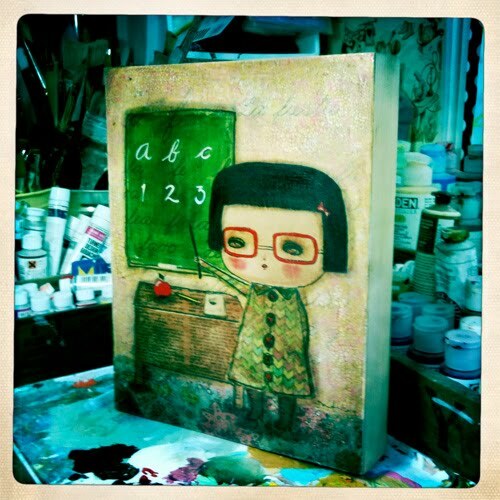 Since it's back to class time I thought It would be nice to honor all the teachers out there with this painting! It will be available tomorrow here. Lots of rings and earrings in new styles and with new illustrations! (I already listed some, they're available here). And beautiful, new unique necklaces (that one with the bird is begging me to keep it home). They'll be ready to purchase soon! I love it! And your jewelry is just so beautiful! 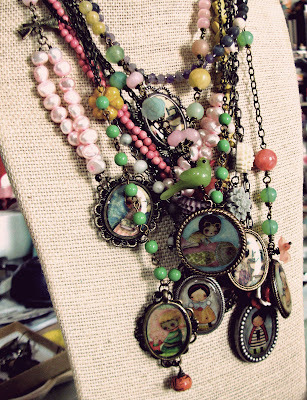 Look at all your pretty necklaces! I can't wait... You know what I'm looking for! Oh my!! I see some rings & necklaces laughing at me!! Your work is a delight! I love it, all of it! Ah!!! I am a teacher of 7-8 year olds and I think I will need this back-to-school print for sure! LOVE it, danita! (I have allergies, are any of your rings set in brass, which I CAN wear on my fingers?). LOVE your jewelry and yes, that bird is yummy!!! I really adore your back to school painting!! She is sooo adorable with those lovely glasses! 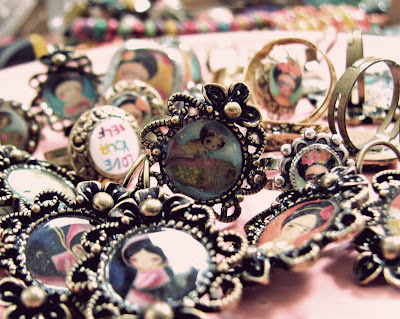 Your jewelry collection are very pretty ~ i heart THE SEAMSTRESS with those gorgeous cabochons! Have a lovely merry happy week and love to yoU! She's so cute. I love the class background, and your necklaces are beatiful. Yes, it's amazing how the belly can grow with a baby. It looks like you have a lot of energy, which is great. I love the rings and necklaces.